Jose Flores' late single in this May 1993 game didn't mean much in the outcome of the game. It knocked in Osceola's third run in a 10-3 loss. The single, though, did do something else. It extended Flores' hitting streak to 18 games, according to The Orlando Sentinel, tying Flores for the franchise best mark. Flores went on that streak in his fourth season as a pro. He came back for a fifth season in 1994, making AA, but he never made it higher. Flores' career began in 1990, taken by the Astros in the 38th round of the draft out of his native Puerto Rico. He played his first year at short-season Auburn. He hit .183 over 42 games there. He moved to single-A Asheville for 1991 and 1992. He also showed progress. He hit .220 his first year there and .267 his second. 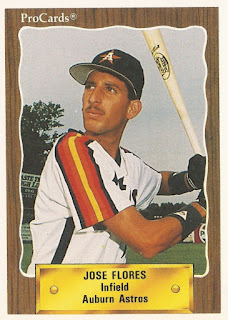 Flores then made high-A Osceola for 1993. He hit .243 over 124 games there. He also knocked in 39 and stole 12 bases. He went 0 for 3 in a May win, but scored two runs. He then went 2 for 6 in a July extra-inning loss. Flores made AA Jackson in 1994, but his stay was brief. He hit .192 over 47 games, ending his career.